There are scenes and stories closer to home. There are the innumerable scenes of the aftermath of violent crime. Crime which is so rampant we don't dare take an evening walk but lock ourselves in at night like prisoners. My friends we are suffering from a national disease of spiritual poverty. And it's effects are violence, racial hatred, greed, and worse of all, 'apathy.' It is like a cancer. If we do nothing to stop it, it will spread until its effects render us helpless. It reminds me of the spread of drug abuse. When I was a kid we called marijuana "weed." Later when it spread to the suburbs it was given a respectable name, "grass." It was then that drug centers sprang up in every community to treat the problem, because it had become the problem of people with power and wealth. 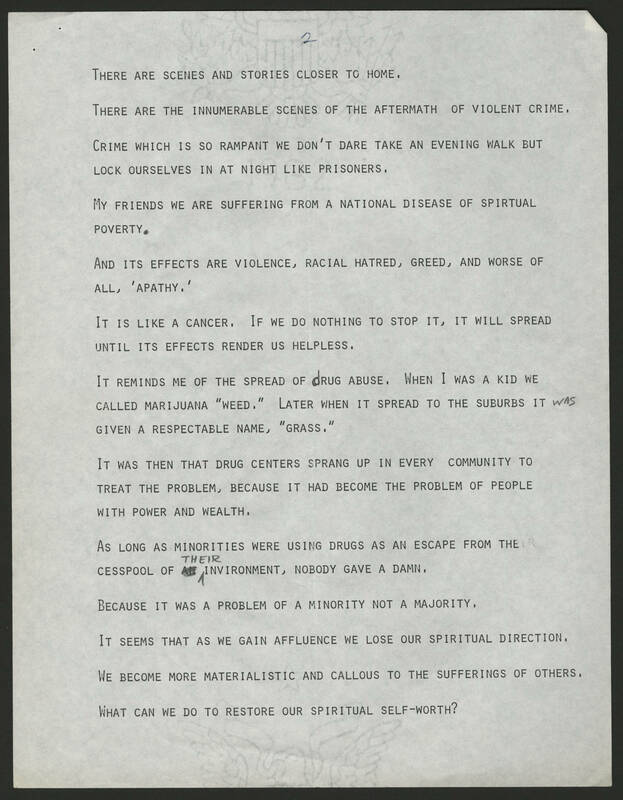 As long as minorities were using drugs as an escape from the cesspool of their environment, nobody gave a damn. Because it was a problem of a minority not a majority. It seems that as we gain affluence we lose our spiritual direction. We become more materialistic and callous to the sufferings of others. What can we do to restore our spiritual self-worth?